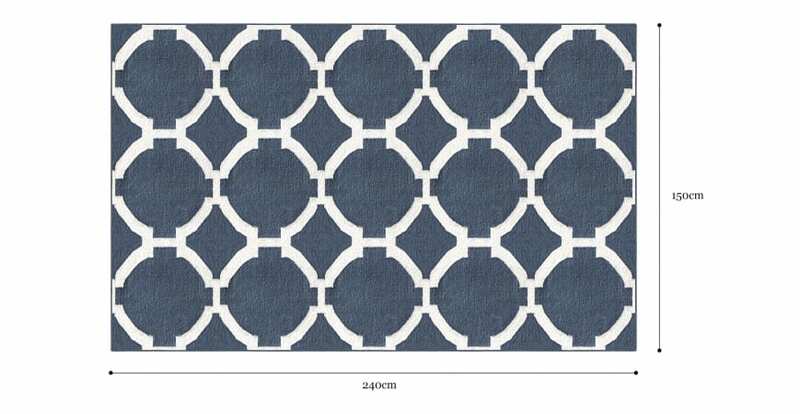 Designed to complement several furniture styles and shades, the Alegra Wool Rug features a striking geometric design. The piece has been handmade in India by Brosa's generational team of makers, with hours of love and care going into each piece. Bold blue contrasts against a bright fresh white in the Alegra, which has been washed and carefully treated to bring out the sheen of the natural fibers. Shop the complete range of rugs on offer from Brosa to find your perfect fit. The wool for the Alegra has been carefully sourced and hand selected for the best possible quality. The expert weaving and maker process ensures this designer piece will stand the test of time and be looking great in your home for years to come. Consistent and comprehensive checks throughout every step of the process means every Alegra is of the highest standard of quality. Match the Alegra with a range of lounge and sofa sets that are equally as stylish. Good news! Alegra Wool Rug 150 x 240cm is currently on display in our Alexandria Collingwood studio.